The Algarve possesses a beauty that usually exceeds the expectations of visitors. Its amazing views are garnished by the relaxing light blue sky, the Atlantic Ocean and by the smell of salty waters and traditional sweets. The origin of the name Algarve dates back to the early Middle Ages, when the Muslims occupied the region and called it ‘Al-Gharb’, meaning ‘the west’ in Arabic. Many places in the Algarve present a quite peculiar architecture, thanks to Arabian and medieval influences. The Algarve is known for having perhaps some of the most beautiful beaches in Europe. Here you can find long sandy beaches along the coast from the Spanish border to Albufeira, as well as sheltered lagoons and sandy islands from Tavira to Faro. But there also hundreds of beaches protected by sandstone cliffs between Albufeira and Sagres. Traditionally, these two completely different parts of the south coast of the Algarve are known as Sotavento (which corresponds to the sandy Algarve) and Barlavento (which corresponds to the rocky Algarve). 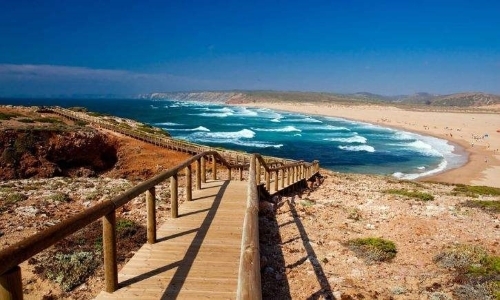 Besides that, there is a strong environmentally protected west coast called Costa Vicentina, which is a paradise for lovers of nature and tranquillity.